Three decades ago, a tiny war changed the armed services for good. 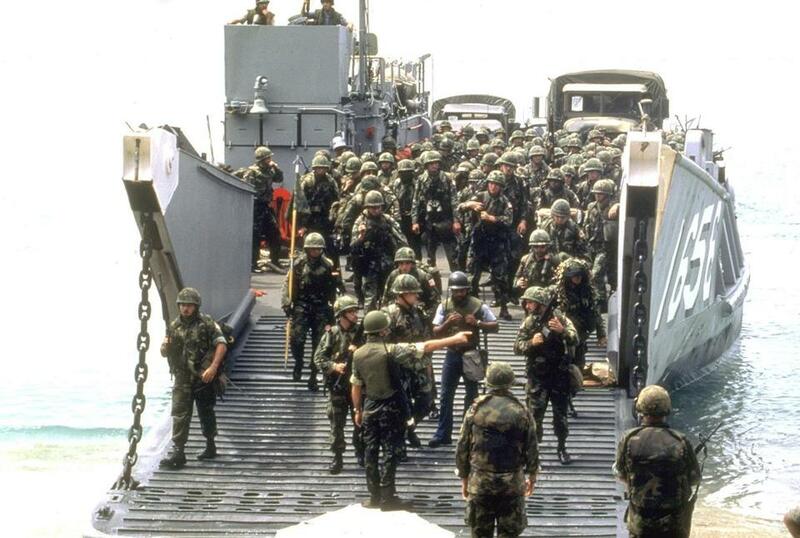 American troops disembarked at the start of the invasion of Grenada on October 25, 1983. 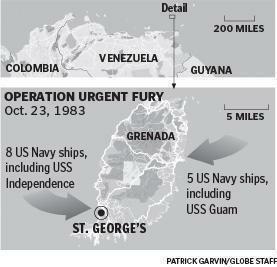 On Oct. 25, 1983, the United States invaded the tiny Caribbean island republic of Grenada, a military mismatch analogous to a Goliath doing battle with a David—only with no sharp stones in the shepherd’s pouch. Hostilities on the island were declared over within a week. The invasion is remembered today in America, if at all, as a brushfire war where the US military won a restorative victory in its first full-fledged combat since the ignominious end of the Vietnam War a decade earlier. In subsequent years, the American military would march on to victory in Panama and in Kuwait, and then deploy for larger, much longer wars in Iraq and Afghanistan. But 30 years after the invasion of Grenada, hindsight suggests that this little war turned out in the long run to have a disproportionately large effect on the American military. The victory took longer to achieve and was more costly in American casualties than it should have been because of serious flaws in how the four uniformed branches performed together in joint combat. And in key respects, how the Pentagon is structured today—how military combat commands are organized and led, how officers get to be admirals or generals, and how the military relates to the news media on the battlefield—is because of the embarrassing lessons it learned in Grenada. Today the military has a new set of experiences under its belt. And with defense cuts looming again, it faces what many believe will be similar challenges to those of that time: how to adapt for new kinds of engagements, and ensure that all the military services, indeed all branches of government, work effectively together to plan and fight the inevitable next war. The example of Grenada suggests that productive change can, indeed, come to even a resistant, entrenched bureaucracy—but it also offers a vivid warning about what can happen when you wait to make these changes until after the shooting starts. Grenada marked perhaps the lowest ebb in military-media relations since the Revolution. For most of its modern history, Grenada’s principal claim to fame—besides wide, sandy beaches and a gentle climate—has been as a leading world exporter of spices, especially nutmeg. An island microstate located 100 miles off the coast of Venezuela, it has a population comparable to the city of Cambridge, Mass., and a land area equal to Philadelphia’s. But after the nation gained its full independence from Great Britain in 1974, the tiny state played host to very volatile domestic politics. On Oct. 19, 1983, Grenadian Prime Minister Maurice Bishop, three of his cabinet ministers, and seven of his close supporters were executed by Grenadian soldiers on the orders of a hard-line faction within Bishop’s own Communist-style party. The killings plunged the country into governmental chaos, raising fears for the safety of about 1,000 Americans living on the island, including 600 US students attending St. George’s University School of Medicine. Even before the killings, the Reagan administration had been concerned about the growing influence of Cuba and the Soviet Union on the island’s leftist government, especially the potential military uses of a new 9,000-foot commercial runway then nearing completion on Grenada by Cuban construction workers. 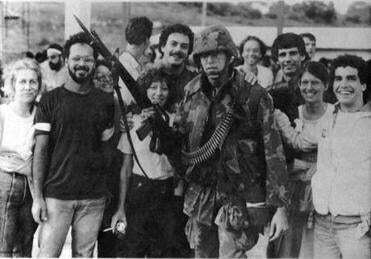 A solider posed with students from the school after the invasion. When the bloody coup occurred in 1983, a US Navy aircraft carrier group and a Marine amphibious unit happened to be in the Atlantic in route to the Mediterranean. The battle-ready force of 11 ships was diverted south to Grenada. A secret American-led invasion was hastily organized and launched. An American force of more than 6,000 that included elite troops from all four uniform services was dispatched to the island. The resistance they faced was a poorly trained Grenadian Army of about 700 front-rank soldiers supported by 650 military-trained Cuban construction workers and 43 Cuban and Soviet military advisers. In charge of the American force was Vice Admiral Joseph Metcalf III, a three-star admiral with the US Navy. H. Norman Schwarzkopf, then a two-star general in command of a Georgia-based Army division, was picked by the Pentagon to be the Army’s top liaison to Metcalf. In his autobiography, Schwarzkopf recalled feeling “about as welcome as a case of the mumps” when he reported for duty with the Navy. That feeling foretold a great deal. Given the mismatch of forces, American victory in Grenada was preordained. But the US military had a much tougher time at the start of the invasion than expected. The Grenadians and the Cubans offered surprisingly stiff initial resistance—and American combat units proved maladroit at working together. Four Navy SEALs drowned at the start of a pre-invasion reconnaissance mission after an air drop from an Air Force transport plane. As the invasion proceeded, Army combat units found that they couldn’t talk to Navy support ships offshore because their radios weren’t compatible. Navy bureaucrats objected to refueling Army helicopters when they unexpectedly landed on their ships. A Marine officer balked at flying Army Rangers into battle on Marine helicopters. A Marine officer later told an official military historian that he was more afraid of being shot at by the 82nd Airborne than he was of the Grenadian Army. Another Marine officer was so concerned by his lack of coordination with nearby Army paratroopers that he later told an official military historian that he was more afraid of being shot at by the 82nd Airborne than he was of the Grenadian Army. 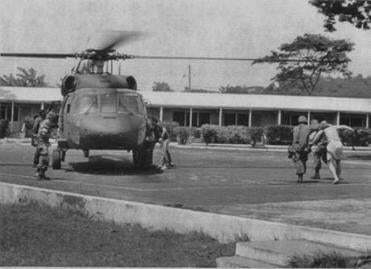 US Army medical personnel helped a wounded soldier to a helicopter at St George's University School of Medicine in Grenada. On the third day of fighting, an errant air strike by a Navy jet wounded 17 Army Rangers, one of whom later died. In all, 19 Americans were killed in the invasion, including two New Englanders. First Lieutenant Jeffrey R. Scharver, from Barrington, R.I., was the copilot of a Marine attack helicopter that was shot down after being ordered to provide high-risk air support for a Navy SEAL unit that got trapped in the capital city. Army Specialist Philip S. Grenier of Worcester was one of three Rangers killed in a chain-reaction helicopter crash during an assault on a Grenadian military barracks that turned out to be deserted. Colin Powell, then the two-star senior military assistant to Secretary of Defense Caspar Weinberger, wasn’t impressed with the eventual victory. The interservice snafus on Grenada did not come as a surprise to military experts. The US military had displayed similar coordination problems in Vietnam, in the star-crossed 1980 attempt to rescue 52 American hostages being held by Islamic militants who had overrun the US embassy in Teheran, and in the bombing of the Marine barracks in Lebanon, which happened just two days prior to the Grenada invasion. The root of the problems was traced to organizational dysfunction. For most of the 20th century, the Army, Navy, Marines, and Air Force were organizational silos. Servicemen were recruited, trained, equipped, and promoted according to the unique mission, culture, and tradition of each uniformed branch. This led to parochialism in outlook and bred interservice rivalry, though modern warfare doctrine called for all the armed forces to fight in concert on the battlefield. At the time of Grenada, a bill to unify the Pentagon command structure had already passed the Democratic-controlled House but was opposed by the Joint Chiefs, the Secretary of Defense, and the Republican-controlled Senate. The embarrassing foul-ups in Grenada, as documented in the military’s own after-action reports, helped break down the brass wall at the Pentagon. Eventually a turnover in leadership in the Joint Chiefs and in key congressional committees created the cultural climate needed, and military reforms passed as the Goldwater-Nichols Act of 1986. “I would argue that Grenada served as a final trigger,” Richard J. Norton, a professor of national security affairs at the US Naval War College in Newport said in a recent interview. To clarify the military’s chain of command, the 1986 act formally elevated the chairman of the Joint Chiefs to the position of being the president’s top military adviser. It strengthened the authority of the existing regional war-fighting joint commanders over all the troops assigned to them. To improve relations among the branches of the military, it also mandated that any officer aspiring to become a general or admiral must serve at least one tour of joint duty working with another branch of the service. The practical effect of the first two changes became clear during the 1991 Gulf War when Powell, now elevated to chairman of the Joint Chiefs, and Schwarzkopf, now the commander-in-chief of Central Command, used the enhanced power of their respective positions to achieve swift victory on the battlefield and celebrity status back home. The Goldwater-Nichols reforms ameliorated tensions between the services but did not eliminate them. Tensions are again on the rise today as the services compete for a dwindling pool of defense dollars. The Wall Street Journal recently reported that squabbles have broken out among the uniformed branches over which service or services should station helicopters on Navy ships, operate the military’s manned surveillance aircraft fleet, and manage drone aircraft. Inside the Washington Beltway, defense analysts are currently debating the need for a “Goldwater-Nichols II” that would further reshape the nation’s defense organizational structure to meet the needs of the post-Iraq/Afghanistan future. Contemporary warfare is a highly complex enterprise closely linked to diplomacy, advanced technology, security, and domestic policy. Some argue the next wave of reform should be to create a new “whole of government” structure that would foster closer coordination among not only the branches of the military, but also defense-related agencies such as the CIA, the State Department, and Homeland Security. No political consensus for Goldwater-Nichols II reform legislation has emerged, but it could be on the horizon. “The critical mass may come from the severity of the defense drawdown,” said Murdock. Given America’s global reach, other unexpected military challenges are sure to suddenly arise in unlikely places in the 21st century. As Grenada shows, if the known deficiencies of the military aren’t rectified between wars, they will extract a surcharge in blood on the next battlefield. Phil Kukielski of Somerset, a retired managing editor for The Providence Journal, has visited Grenada multiple times and published a number of articles about the invasion and its aftermath. Correction: Because of a production error, a map of Grenada was misprinted in some copies of the Sept. 8 Ideas section in our print edition. The correct map is included with this story online.